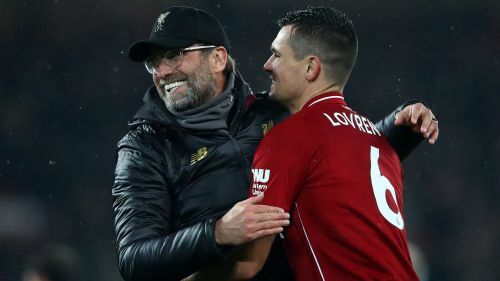 Liverpool defender Dejan Lovren hopes Jurgen Klopp's men can match Arsenal's 'Invincibles' in the Premier League this season. Klopp's side are the only unbeaten outfit left in the league and hold a one-point advantage at the top ahead of visiting Wolves on Friday. Lovren wants Liverpool to match what Arsenal achieved in 2003-04, when they went unbeaten in the Premier League. "Hopefully we can be unbeaten until the end of the season," the Croatia centre-back said. "Of course it will be a challenge but this is what we want, this is why we came here to Liverpool, because we know we can do it. "Arsenal did it before so why not?" Liverpool (45 points) are only just clear of City (44), while Tottenham (39), Chelsea (37) and Arsenal (34) are still somewhat in touch. Lovren said every game was important for Liverpool, who have clashes with Arsenal and City coming up. "I'm not sure that they [City] have any weaknesses," he said. "Last year they won by 19 points. They know how to manage even when they lose. They also lost one or two games last year and still they managed to be 19 points ahead. "It doesn't mean anything. There are so many games in front of us and in front of them. It will be a tight race and it's not only City. Tottenham are only a few points behind. "You cannot sit and enjoy and say, 'We are five or six points in front of everyone'. It doesn't work like that. Every game for us is a final."